Gypsum fiber board, also known as calcium silicate board, is a porous material with good insulation, thermal insulation performance. When the indoor air is humid it can attract water molecules; when the air is dry, it can release water molecules to adjust the indoor humidity and increase comfort. Gypsum products are special fireproof materials,which can absorb the heat in the flames and release water molecules at the same time to prevent the fire from spreading, and will not produce any toxic decomposition,erosion of, it would not have any ombustion or flue gas. 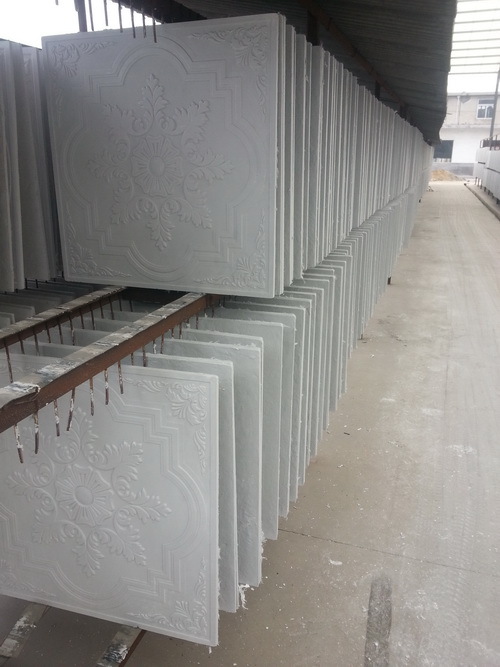 The gypsum ceiling tiles are made of harmless highquality natural gypsum powder, is free of resin and formaldehyde and nonradioactive and do not release any poisonous substance under common conditions and even under heating or firing condictions. The materials are incombustible, also the free water in the tiles has the fuction of preventing fire. The insides of the boards are microporous and can automatically absorb moisture and drain the moisture to the enviroment according to moisture difference, so thatroom moisture balance and comfortable habitation can be kept. The insides of the boards are microporous and can also absorb sound. Fiberglass is put into the tiles so that the tiles become very strong and will not be damaged easily.